Since that time, we have developed tools that permit us to embark on a scientific exploration to try to answer this old question. We no longer have to ask the priests and philosophers what we should believe about extraterrestrial life; we can explore and discover what’s actually out there. Our tools are getting ever better. We have discovered extremophiles in the most unexpected places on this planet and we have discovered that there really are far more planets than stars out there. We haven’t yet found life beyond Earth, but there is a vast amount of potentially-habitable real estate to explore. The 21st century will be the century in which we will find some answers to this old question; there are many paths we will investigate. We should better understand whether Fermi’s question really is a paradox. As we look up and look out, we are forced to see ourselves from a cosmic perspective; a perspective that shows us as all the same, all Earthlings. This perspective is fundamental to finding a way to sustain life on Earth for the long future. 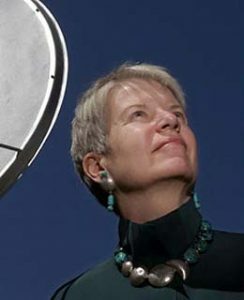 Jill Tarter is the Chair Emeritus for SETI Research at the SETI Institute in Mountain View, California and serves as a member of the Board of Trustees for that institution. Tarter received her Bachelor of Engineering Physics Degree with Distinction from Cornell University and her Master’s Degree and a Ph.D. in Astronomy from the University of California, Berkeley. She has spent the majority of her professional career attempting to answer the old human question “Are we alone?” by searching for evidence of technological civilizations beyond Earth. She served as Project Scientist for NASA’s SETI program, the High Resolution Microwave Survey and has conducted numerous observational programs at radio observatories worldwide. She is a Fellow of the AAAS, the California Academy of Sciences, and the Explorers Club, she was named one of the Time 100 Most Influential People in the World in 2004, and one of the Time 25 in Space in 2012, received a TED prize in 2009, two public service awards from NASA, multiple awards for communicating science to the public, and has been honored as a woman in technology. She was the 2014 Jansky Lecturer. In 2015-16 she served as President of the California Academy of Sciences. Asteroid 74824 Tarter (1999 TJ16) has been named in her honor. Since the termination of funding for NASA’s SETI program in 1993, she has served in a leadership role to design and build the Allen Telescope Array and to secure private funding to continue the exploratory science of SETI. Many people are now familiar with her work as portrayed by Jodie Foster in the movie Contact.